This series of WW1 ebooks has its origins over ten years ago when I was researching material for a number of short films about the last letters soldiers had written before they had died on the battlefield. As I sat in the old circular reading room of the Imperial War Museum in London ordering collection after collection of soldiers’ letters, I came upon the letters of Wilbert Spencer that now feature in the first book of the series. As I read them, his young, exuberant, gentle character formed a hugely powerful image in my mind. It were as if time had dissolved and I could almost see and hear him speak. His death when it came, so abruptly and at such a young age, felt as if someone I knew had died. Even now, ten years later, having read and reread his letters countless times, they still have the same effect. 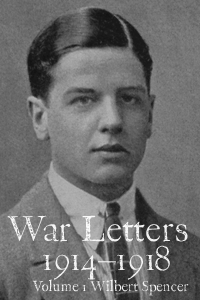 It was the power of these letters that gave me the initial idea of compiling a book that would tell a history of the First World War using the words of men, like Wilbert, who had died in the conflict. Since then, any spare moment I had was spent scouring different archives and collections, reading hundreds and hundreds of letters and laboriously transcribing faded, sometimes hardly legible handwriting. Eventually the letters that make up this series began to emerge and take shape. The letters are drawn from archives and personal collections all over the world. Most of the collections of letters have not been previously published. Of those that have been published, one was published and two were published privately by the men’s families just after the war; one was published in 1915 by a local newspaper in Australia. Together they tell a story of the war from 4 August 1914, when the seventeen-year-old Wilbert Spencer decided he wanted to become an officer, until 10 November 1918 when a young British pilot dies as his plane is shot down over Germany. They include the experiences of four British servicemen, two Australians, one New Zealander, a Canadian and an American; they cover the evolution of the war on the Western Front, the fighting at Gallipoli and Mesopotamia and the war at sea and in the air. The men selected, however, do have an important story to tell. Contrary to the perception of a generation unable to express their emotions, the letters reveal the deeply moving emotional life of ordinary men in extraordinary circumstances. Their complex, sometimes contradictory responses at times reinforcing and at other times directly challenging modern views of the First World War. Usually with works about the First World War that draw on the contemporary letters and diaries of a number of different people, a strong sense of each individual can be lost as their words are disembodied and used to illustrate an event, experience or theory about the war; in such works, for all their strengths, the individual is almost always secondary to the greater narrative or idea. The powerful experience of reading Wilbert’s letters made me to want to avoid this. I didn’t want to continually interrupt each man’s writing with a narrator’s voice, explaining, clarifying or (heaven forbid) theorising. In fictional terms I wanted something that was character driven rather than plot or ideas driven. I wanted to use a form in which as a reader you can truly begin to immerse yourself in the words and world of each individual. That is why the letters are presented as they are, with all their gaps, silences, ambiguities and contradictions. Reading the individual voice in this way, uninterrupted, is in many ways more akin to reading a work of fiction which can have a power and emotional impact that most forms of non-fiction are unable to emulate. The difficulty with such an approach is how to effectively provide the bigger picture and and fill in some of the gaps and details that are left unsaid. Fortunately two connected developments provided an answer. The first was the almost exponential growth of online resources about the First World War: fascinating, important documents and material available to anyone in the world able to access the internet. The second was the emergence and rapid growth in popularity of the ebook, particularly the short ebook. It was the desire to incorporate and share this constantly emerging treasure of resources scattered throughout the web, while still presenting the men’s own words as they were written, that made me realise that the ebook was the perfect vehicle to do this. The easily navigable form of the ebook enables the letters to be read as they were written, but while there is no commentary to interrupt the men’s words, comprehensive notes are just a click away: the traditional, often overlooked endnote is now woven into the integral structure of the book. The notes are there to add detail, context and colour for those who want to understand more about particular aspects of the men’s lives and experiences. They include not only comments on military matters, but on a wide range of very different aspects of the men’s lives which together help paint a richer portrait of the men and the times in which they were living. They can be read or freely skipped depending on your interest. Wherever possible the notes provide direct links to resources that are available online. I have focused on links which aren’t hidden behind paywalls, but which, in almost all cases, are open to access for all. The links don’t include Wikipedia (which can be easily accessed using the search facility in the Kindle), but they do include battalion diaries, recordings of old songs, war memoirs, military training manuals, official histories, trench maps, documentary films and much, much more. They permit any reader who wants to, to embark on their own journey of historical exploration and discovery by delving even more deeply into many more aspects of the war. Each book in the series follows the same structure. The short introductory essays are intended to provide just enough about the men’s personal background and their situation in the war to act as a springboard into the letters. They take you up to the point the person starts writing and no further. To avoid littering each page of letters with endnote numbers, I have grouped the notes for a particular paragraph under a single number. When you read the notes, links by each one take you back to the beginning of the original paragraph. Ibid. is used in the notes, but only to refer to the reference directly above. The appalling op.cit. (rougly translated as ‘look for it yourself because we can’t be bothered’) has been left in the bin where it belongs. It is perhaps finally worth pointing out that this is an edited series of letters. Some of the men wrote so much that to include their work without some abridging would have made them very heavy going. In other cases, unnecessary repetitions have been removed and occasionally, for clarity, there has been some slight reordering of passages, but never in anyway which affects their historical accuracy or meaning. Spelling and punctuation have also been made consistent within each set of letters. Although the original letters from Indian soldiers have not survived, extracts from different letters do exist in the reports made by British military censors. These, however, are short extracts from hundreds of different soldiers and are impossible to fit in the format of this series. For the best study of these letters see Omissi D. E. (ed. ), Indian Voices of the Great War – Soldiers’ Letters, 1914-1919 (Macmillan, 1999). The British Library is also in the process of digitising twenty-two volumes of the censors’ reports which it plans to make freely available to all. Surviving letters from soldiers in the West Indies are extremely hard to find as can be evidenced by their total absence from the most recent and wide-ranging book about race and writing during the war. Das, S., (ed. ), Race, Empire and First World War Writing (CUP, 2011).